It finally happened for us today! Miracles of all miracles! We have been searching high and low. In Chicago…. Alabama, Tennessee, Kentucky, Ohio, Indiana….. back to Chicago again. We considered converting buses, drove a few and almost bought one and that fell through due to car dealer negligence (blessing in disguise). 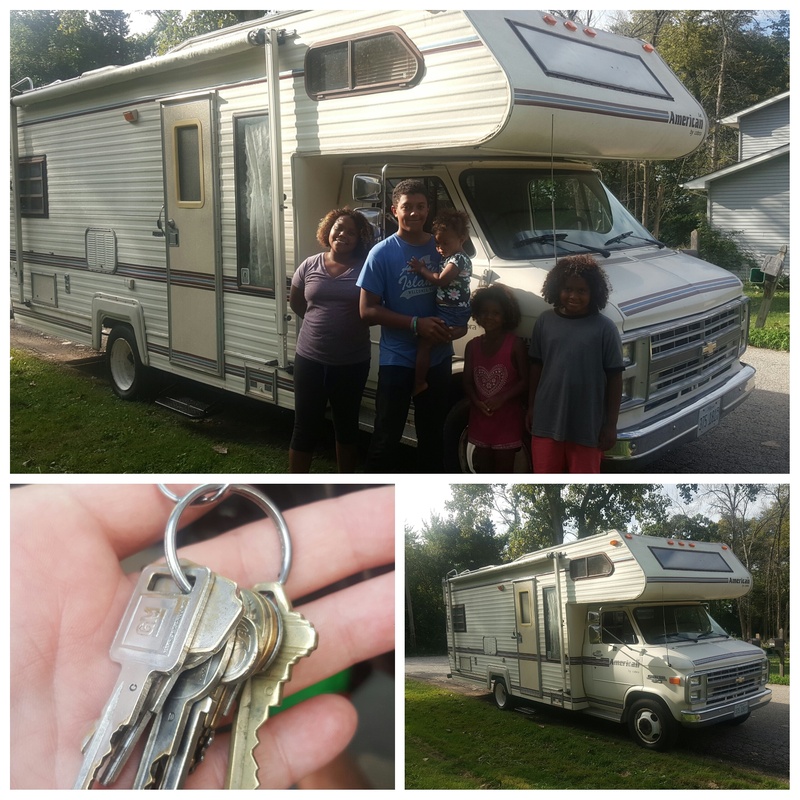 We looked at several more and then after seeing an RV we honed in on that as being right route for us. Then…. made an offer outside of our budget simply because I fell in love too quickly and then needed to renig cause going in debt was not what it was about. Since we were going to be on the road anyway figured it’s likely best to check out each state as we roam. Country farms and budgets more accessible seemed the way to go. Having failed appointments, seen the worst of the worst, RVs selling before we even made it to the schedule appointments….. and….. test driving an already converted diesel bus I was not quite sure I was willing to put my most precious beings in, we came back to Chicago empty handed but with one last appointment set for the time being. Figured if this last one were not ‘the’ one, then we had a slew more states to track one down in as we head to Ohio this week and then westward to Phoenix by end of September. Alas! This was a great fit! The body is in incredible shape. The inside quite vintage and ready for our personalizing. It’s not huge-mongous like I was attempting to avoid, and yet sleeps us all. The mileage under 80K. Within budget so we are officially loan free and can work on rebuilding ourselves financially. The one and only clincher…. minimal storage so I’m about to get crazy-creative. The ultimate small-spacing living challenge is ON! I’m pumped at the challenge at hand and simply relieved this decision has been made in a manner that feels insanely fun, scary, exhilarating and AMAZING all at once! After purchasing we made it to the DMV for title and plates with just 15 minutes to closing time. All went smoothly without a hitch. Incredible to have been on such an amazing journey and see it to materialize to this magnificent outcome! We pick her up tomorrow, and say a bittersweet goodbye to our blue bus tomorrow in turn. 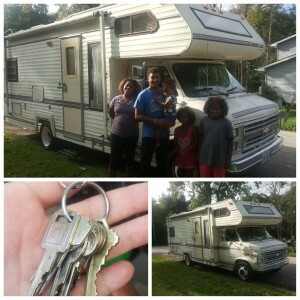 We get the new-to-us RV cleaned up and ready for packing. Sunday is K’s movie premier and Tuesday our very last beach outing to celebrate C and M’s birthdays… and our departure. Excitement buzzing all around. I tell ya, we have been so blessed by the immediate friends and community supporting our adventure…. I’m beaming with abundant gratitude for these amazing beings in our lives! We are truly blessed and lucky!